The Oculus Rift virtual reality technology is one of the most exciting developments in gaming since original Nintendo. But can it be useful beyond gaming? You bet. Non-game virtual reality applications are poised to transform an enormous array of industries, including health care, oil & gas, architecture, education and just about everything in between. It’s hard to imagine any industry that won’t be impacted by VR. Even with the first Rift prototype, we’ve seen our clients enjoy tremendous success, whether they’re architects or construction companies using the Rift to gain client approval on a design concept, or industrial manufacturers helping potential customers visualize massive equipment they couldn’t otherwise transport to their trade show booth. In fact, creating applications for use in trade show exhibits are among the most popular application types we’ve developed for Rift this past year. Manufacturers, engineers, medical equipment suppliers, automotive companies and a variety of retail experiences have resulted in lines forming at these exhibit booths, resulting in huge sales and marketing success for our clients. We’ve learned a lot these past few months, about what it takes to build a successful application for use in museum exhibits and trade show booths, and put together 7 of the most common lessons learned or opportunities discovered. 1. Stay Seated. Nearly every single person who visits your booth will have never experienced virtual reality before, and it can really take people by surprise, being transported and immersed in a different world. As they’re taking it all in, they can easily lose their balance, especially if they’re moving around the space. You really need to have all visitors sit in a comfortable seat while they try out the Rift. 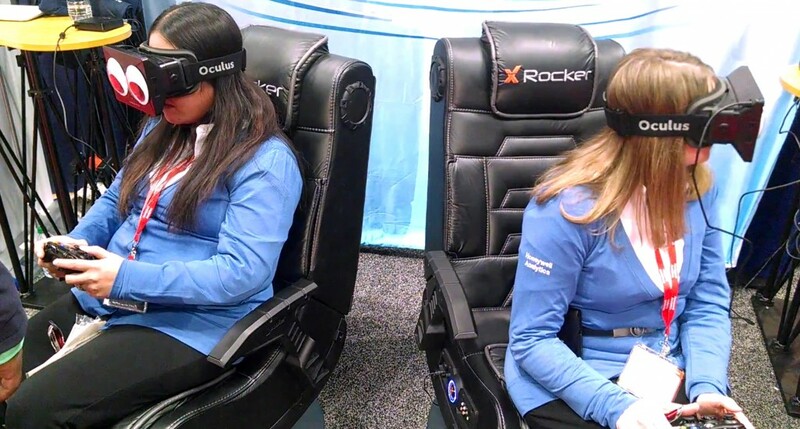 The Wessels Company took this one step further, when they showcased the ‘Virtual Warehouse’ application we developed for them – using nice comfy seats with built-in speakers so visitors could hear the audio of the VR application while also being able to communicate and hear narration of what they’re seeing. 2. Be sure to have another monitor or TV nearby, which either duplicates what each visitor is seeing, or plays through pre-recorded footage of the VR experience. Just by looking at the Oculus Rift hardware, or even seeing someone trying it on, you really can’t tell how it really works, or what you might expect to see when you’re ‘inside.’ By showing some content on a nearby monitor, passers-by can take a sneak peak at what the VR experience is all about. The Suzuki Driving Experience we developed for Suzuki with Sahaj Interactive was accompanied by a large screen displayed above the Rift stations, which were very effective in attracting crowds and lines to form to try out the driving game we developed for them. We also integrated their application with the Logitech G27 hardware for added realism and immersion. 3. Have Fun! One of the biggest joys of working with these clients has been their sense of humor, and desire to make the VR experience genuinely fun for visitors to their booth. It can also help make the experience educational. For example, in Wessels’ Virtual Warehouse, we used a pipe explosion to grab the viewer’s attention and showcase the utility of their “Shock Arrestor” product. Our next project features a zombie that scares the %^#% out of everyone who tries it out. As people shuffle through massive trade show halls, they quickly forget just about everything they see. They won’t forget this one. 4. Clean the lenses! This is an easy one. With hundreds of people trying on the Rift, the lenses are bound to get absolutely filthy. Don’t forget to bring along lots of lens cleaning wipes or microfiber cloths. 5. Don’t wait for DK2. No doubt, the next generation developer kit Oculus Rift is going to be amazing. The team at Oculus VR wouldn’t be too pleased with this advice, but the truth is, the first generation developer kit is still a mind boggling awesome experience and perfectly adequate for use in a primetime application like a trade show. Just ask any of our clients who have tried it. Again, most of your visitors aren’t going to have a clue with the Rift is, so they’ll be blown away by it even if you don’t have time to wait for the next developer kit or consumer version of the Rift. If you have an upcoming show anytime this year (hello IMTS exhibitors… ) and are thinking of building a VR experience for it, now is the time to get started. When the new products are released, the applications we build can be easily upgraded to the new developer kit at no extra charge. 6. Use a Controller Our first few applications were primarily driven by keyboard and mouse, and it quickly became apparent that we needed a better way to enable our clients to explore these virtual environments. Using a wireless XBox controller made it much easier for people to explore, without having to awkwardly guide the visitor’s hands to a keyboard and mouse (since their vision is obscured by the Rift). 7. Easy on the motion. You certainly want the visitor’s experience to be fun and engaging, but dropping them in the middle of a fast paced game environment can be overwhelming and cause motion sickness. We developed the Quick Link Navigation interface with this in mind, enabling visitors to explore a scene without necessarily having to use a controller. We also try to gradually introduce various elements of the VR experience instead of jumping in all at once. In the lobby of the Wessels Company Virtual Warehouse, we created a lobby space, where the visitor can get used to the VR experience before moving into the main room full of interactive products. Send us a note and tell us more about your ideas for a VR application you’d like to build. Don’t be afraid to think big! Anything is possible, and we’re happy to help realize your vision, and to make your next trade show exhibit a huge success.